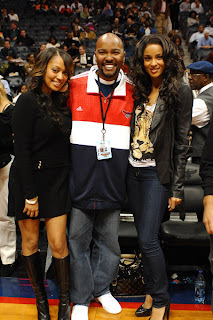 The Atlanta Hawks vs. Denver Nuggets game had a little bit of star power in the house last night and the good thing is that Atlanta won 104-93 well I guess LaLa would have wanted Denver to win. Ciara, LaLa, Jermaine Dupri, Ryan Cameron (One of ATL's top party promoters), and good ole' Keisha Knight Pulliam were in attendance. LaLa, was wearing a simple black cashmere/acrylic dress and knee boots, which I thought was demuring. Ciara was wearing a trendy tee, with stylish leather blazer, pumps, and skinny jeans. 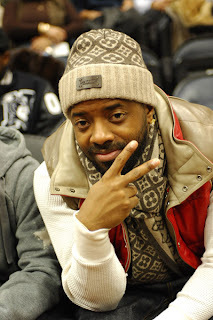 Jermaine Dupri wore Louis Vuitton skull hat and scarf in cashmere with a down-filled vest. I am so good. Check the link to my post when I said that this LV set would be a good fashion statement for a man, Jermaine must be one of my readers ;-) Keisha Knight Pulliam wore a v-neck, short-sleeved, black sweater on top of a brown, black and gold retro type top.